Murder, even in self-defense, is a preemptive act. Raven Balback’s obsessive husband demands she return to their marriage. The frightened woman, partially paralyzed from her last encounter with him, flees. Unable to locate his wife, Cole burns the buildings that sheltered her in the past and endangers lives. Raven must decide whether to sacrifice herself for strangers or grasp for a life free of her vows. 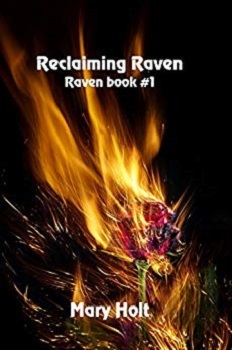 The book opens with a dramatic escape by the heroine Raven, she’s escaping from her husband Vole who’s love for Raven went from lovingly protecting her to complete control and then to abuse – verbally and physical. It got so bad for Raven the only option left for her was to flee. Great writing style with an easy time and arrangement of words, plus good use of descriptive words and phrases, draws the reader into the dark world of possessive love, jealousy and coercion. We also read of the kindness Raven receives from two complete strangers who go above and beyond to help. Mary Holt the author sets the theme in modern day and from both Raven and Cole’s point of view. With the dark and volatile relationship we see a dark mood through out the story. The book flowed naturally and the plot unfolded with unexpected twist and turns as we read through the chapters. No way would I have predicted the outcome of this tale, it kept me firmly gripped from beginning to end, definitely a good page turner, and the final chapter was so surprising it left me wanting more. Reclaiming Raven has a well thought out plot. It has lots of drama, action through out. The depth of Ravens character showed her vulnerability but also her sheer determination was clearly defined by the author. I loved the characters portrayed by Isaac and sister Lydia, they too had a determined spirit to help where others wouldn’t even try too. Well done Mary Holt for a brilliant debut novel. I highly recommend this book and shall look forward to hearing more from this author in the future. For twenty years, I was a foster mom to two profoundly disabled young women. They became the center of the family, and everyone who knew us, knew them. We traveled all over the US and Canada, schlepping wheelchairs, oxygen tanks, G-tube feeding supplies and medications for six weeks at a time every summer. The idea for Raven was born from my experience with the girls. Though one was non-verbal and the other used very few words, they knew so much more than they were able to express. I would make a terrible eye-witness to a crime, but they noticed the smallest changes in their surroundings. I don’t think it would be a book for me.